I've been having fun with my new metal cutting equipment. I finally took the plunge, dropped the big bucks. I've started working with 14 gauge aluminum. What a difference. Most cuffs available right now are 20 gauge. But 14 gauge is much thicker. the strength of the piece by over working it. 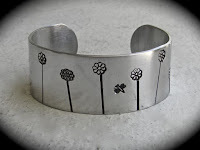 Yesterday I posted some of these cuffs for sale on my site gottagettadeal. It will be interesting to see what kind of response I get to these. Let me know what you think about the 14 gauge cuffs? 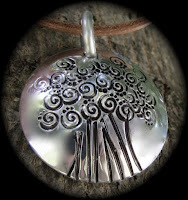 I also made a pendant today using even thicker aluminum sheet. to get the dome shape to the pendant. These are also available on my ETSY site gottagettadeal. with softer metals like silver and aluminum. The metal dapping blocks can smash the metal stamping designs. videos of different jewelry making techniques.